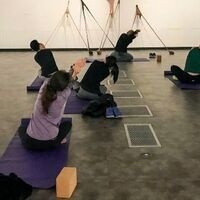 Breathe, unwind and enjoy free yoga at the USC Fisher Museum of Art. Stretch your muscles and meditate in galleries surrounded with works based on aerial photographs of Greenland from Fisher’s current exhibition, Earth Works: Mapping the Anthropocene, by Justin Brice Guariglia. Yoga mats and blocks will be provided. Space is limited. Please arrive 10 minutes early to reserve your spot.